It’s Thursday evening, I’ve got a cold glass of sake in hand, the Blazers are getting just got torched, and I’m nursing a stuffy nose, all while awaiting J. Cole’s new album, and The Verge drops the most frustrating Google-related messaging story on us I’ve read in some time. And I’m not talking about their reporting, which is pleasantly detailed and a great explainer. No, I’m just talking about Google and messaging and the fact that every time you mention those two things together, along with the word “new,” that I just instantly get a headache before I bang my head against a wall. So yeah, let’s talk about tonight’s big report and how I’m interpreting it all after following this saga, including Google’s RCS push, for the past few years. Google has apparently (finally) convinced 50 or so carriers and a dozen phone makers across the globe that RCS (rich communication services) messaging is the future. All of these partners have apparently signed on to a branding of RCS as “Chat,” which isn’t an app, but a name for RCS as a group of services. Holy f*ck, that is the most ridiculous sentence ever written…hang with me, though. Allo is basically dead. That’s fine because no one uses Allo, even if it has some sweet features and potential. Google is pulling the team behind it and moving them over to make sure RCS and “Chat” are adopted as quickly as possible. OK, we all clear on the two big pieces of info? I hope so, because we are going to try and break this all down. According to tonight’s report, Google has everyone that matters outside of Apple ready to adopt RCS and its Universal Profile. Universal Profile, for those not familiar, is a standard set of features and technical specs for the adoption and deployment of RCS from carriers and phone makers. At some point within the past couple of years, everyone in wireless you care about signed up to be a part of Universal Profile, including Verizon, AT&T, T-Mobile, Sprint, LG, Samsung, HTC, Lenovo, Huawei, ASUS, etc. You can see the list of partners here. Not sure what RCS is? You can read about it’s features here. Just know that it’s advanced messaging and is waaaaaay better than your typical SMS and much like Apple’s iMessage. To be clear, the Universal Profile and its partners is not actually new info. We wrote about it in March when T-Mobile said they were ready to deploy RCS Universal Profile on their network. What’s new tonight is the fact that Google and its friends have come up with a name for it that isn’t RCS Universal Profile. Instead, they’ll call it “Chat,” which is dumb as hell. Why is it dumb as hell? Because it’s not a universal app that we’ll all use. Chat is simply RCS Universal Profile with a catchier name. It doesn’t actually mean anything. I’m not actually sure anyone will ever market Chat or talk about it in any sense, other than when referring to RCS. Google isn’t launching an app called Chat. Nor is Samsung or LG or Verizon or AT&T. Instead, they’ll all just adopt Chat services within other messaging apps (like Android Messages or Samsung’s Messages app), which is the adoption of RCS Universal Profile that they all already agreed to adopt anyway. When will you get Chat? Google doesn’t really know. Wait, so how does that change from the past 2 years worth of RCS pushing by Google? There really isn’t a change at all other than Google seems to think they are closer than ever to having everyone on board with Universal Profile. Then again, tonight’s report is pretty clear that Verizon and AT&T weren’t up for commenting, even if they are a part of the group. So for you and I in the US, we already have Sprint with live RCS and T-Mobile hoping to launch it soon, but the two biggest carriers remain silent with their own plans. I promise I’m not trying to be the downer of all downers, but Google started this RCS push in 2016, so we’re already 2 years in. Another 2 years before we have a decent adoption? Man. Does it work with iMessage? Ummm, probably like it does now, as far as I know. Apple wouldn’t comment on adopting Chat either, though there is some hope they could some day. That basically means that Apple controls iMessage and everyone else will be on Chat/RCS messaging. There will still be issues, just maybe not as bad? Hopefully? Chat and RCS perform similarly to iMessage in that they first attempt to send an advanced message to a recipient. If that recipient can’t receive the RCS/Chat message, it’ll revert back to good ol’ SMS. In a perfect world, we’ll all be on RCS, including those with iPhones. I’m sure Apple could pretty easily get in on this action and build-in RCS support to iMessage, but this is Apple and they are a bunch of dicks who like closed ecosystems and don’t like to party with others. Why didn’t Google just build it’s own iMessage? This is probably the most frustrating part of it all. According to The Verge, Google thought about it. They thought long and hard about building just what we’ve all asked for and possibly threatened carriers with that very notion. But in the end, the carriers and partners (likely) caved into supporting RCS Universal Profile and so here we are. Instead of Google saying, “F*ck it” and doing it themselves, they stuck with this, “We’re so open, brah,” thing and worked together. And that’s probably fine! That’s fine as long as Verizon and AT&T show up on time, with gift in hand, possibly a couple of drinks deep, and ready to dance that RCS dance. This might be the most boring launch ever, on par with Gigabit LTE. This will happen and you may or may not know it. I say that because your carrier will have to adopt Chat services. The phone you own, yep, it’ll have to support Chat services. You might already own one that does, but that’s part of the deal. You need to be on a carrier that supports it, with a phone whose messaging app does too. Android Messages will be ready for Chat when your carrier fires it up. As I already said, Sprint is live and T-Mobile will be soon. The big story will be when Verizon and AT&T turn on RCS Universal Profile and (hopefully) don’t limit it to two Samsung phones and their own proprietary garbage messaging apps. If Google is right, this could all happen fairly quickly throughout the rest of 2018 and into mid-2019. That’s not actually that far away if you think about it. Before you know it, you could be sending advanced messages to friends and family that own Android phones. In due time, that could also mean that your iPhone friends are the minority and Chat is king. OK, maybe not in the US, but elsewhere in the world that will likely happen. No, not dead dead. The six people who use it will still get to use it. But like Hangouts, it’s doubtful that Google will build out new features for it. I’m sure they will squash bugs and make sure it runs OK, just don’t expect Allo to ever be the future of Google’s messaging ambitions again. The new features will move into Android Messages, like built-in Google Assistant and better connectivity with Photos or GIFs or Stickers. Android Messages, which is already a really nice SMS app, will keep getting better and better. Oh, want to see something cool? Here is Android Messages’ web client, which has now been confirmed, thanks to a photo posted by The Verge. Yep, the Android Messages web portal is coming! And so I think that’s it. 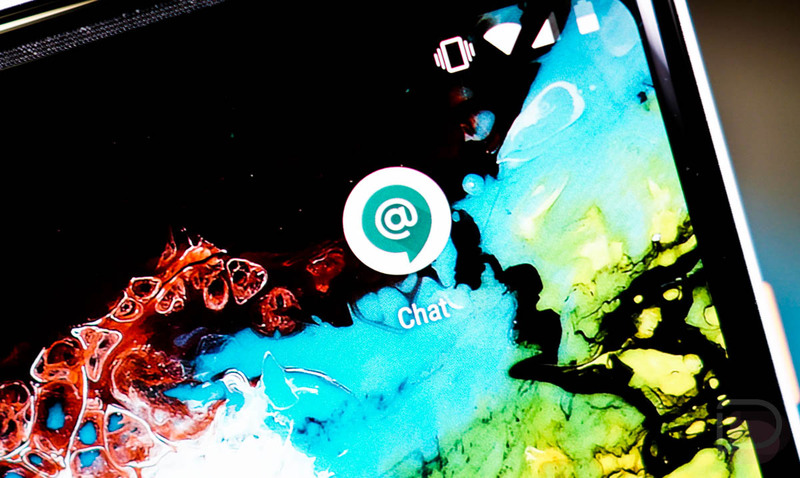 Your takeaway should be that Google thinks it finally has carriers and phone makers on board to push out RCS Universal Profile which they have dubbed “Chat.” As that rolls out through your carrier, you will have advanced messaging and can ditch Allo and Hangouts if you want. It’ll be like having iMessage features (better group chat, high-res images, read receipts, etc.) on an Android phone, only it probably still won’t play that nicely with iMessage. We’ll do our best to let you know when your carrier fires up Chat.